Here’s a recent story from TeleRead, delivered via The Digital Reader, about how belonging to a book subscription service has altered one person’s reading. To enlarge the type below, click on the image. Book Patrol brings us this map created by The Jewish Book Council. “. . . Why is it so shocking to conceive that, in some spheres of cultural production, some aspects may not be subsumed under the logic of late capitalism? Obviously books need to be sold. Does this mean that books are like shoes? Or that shoes are like apples? . . . The current problem is not that books are not shoes, but that Amazon has artificially created a perception of value according to which books are worth less than the majority of goods that are consumed every day. Very often the sandwich you buy in your lunch break is more expensive than the book you buy on Amazon. Is a certain degree of courage required to state that books and culture in general will have more impact on our future as a globalised community than tuna sandwiches? Obviously we are hardly in a position to agree to abandon the capitalist system just because of the Hachette-Amazon debate. It is what it is. Perhaps life isn’t fair, and maybe many of us would prefer a world in which it was. But that’s not a world we can have — at least not without years and years of revolutionary planning which for all I know Irene may be assiduously engaged in. As regards their interface with the consumer, apples and Apples, oranges and Orange’s services, shoes, slippers, boots and books all behave in the same sort of way. People hand over money to acquire them. The amount they’ll be willing to spend for these goods depends to some extent on their “content” — is this a good orange? — and to some extent on market manipulation by the supply chain. How much does the orange grower get? The picker? The distributor? The wholesaler? The supermarket? Ditto of course with shoes, where the analogy perhaps works more clearly because we can see that some shoes are just better made than others. You’ll pay more for the monograph The Elements of Mechanics than you will for bodice-ripper The Love Life of Mechanics. We consumers are used to assessing the relative value of a hardback edition of Ulysses and a paperback printing of it. We haven’t yet managed to take on board the appropriate relative pricing for the e-book. And this is what the debate’s about. So I think the debate remains one about the appropriate price for e-books. I don’t really believe that this decision should be made by the retailer, though there’s no reason they shouldn’t have an opinion on the subject, or even input in the decision. Whatever they may say, that retailer isn’t always able to knock the price down. They may be right that if 100,000 copies of a James Patterson book will sell at $14.99, 174,000 would sell at $9.99. (This sort of claim is pathetically easy to make and luckily for those claiming it, impossible to test.) But take another book they offer, The Edinburgh History of the Book in Scotland, Volume 2. This sells on Amazon’s US site for $266 in hardback, or as a Kindle edition at $144.49. I don’t see them thinking they could sell 174,000 if the Kindle edition were priced at $9.99, or even 74% more than they’ll sell at the full price. Books like this have a market which is small and relatively price-inelastic. I wonder if the sales would be much different if the Kindle price were also $266. Only they and Edinburgh University Press are in any position to test this. Books all live at some point on the distribution line from mass-appeal trade books at one end and The Edinburgh History of the Book in Scotland and its like at the other. Amazon has not “artificially created a perception of value” that books are worth less than the majority of goods — just bestsellers and potential bestsellers. If by pricing lower we’d sell more bestsellers, wouldn’t we be nuts not to do so? But we, as publishers, should be the ones making this decision: not our major retail outlet. Hachette authors should of course be upset that the sales of their books are being impacted by this trade dispute. A trade book gets one shot at making it — when it’s new (maybe two shots if it comes out as a paperback a year or two later) — and to have that chance ruined by Amazon’s disrupting the sale is tragic. They don’t get the chance to go back and do it again once the dispute is settled; other new books will be pushing themselves forward by then. If one of the books affected is the genuine great American novel, one can perhaps assume that it will get its chance to rise again in due course, but most of the trade releases will just be passed over as we all move on to the next new thing. If you are a writer trying to make a living by your writing alone, this is awful; rather like having the publishing company you work for go out of business and lay off all its staff. However the world doesn’t owe publishers a living — nor authors either I fear. *I have no idea what he believes, and can only applaud his gifts to independent bookstores, and his providing employment for his creative team. The Scotsman gave us this list back in 2005. No doubt they might want to add one or two more recent ones: but if you want to understand the world’s newest potential nation — here you go. Driftnet by Lin Anderson: This crime book has flown off shelves. When a teenage boy is found murdered in a Glasgow flat, forensic psychologist Rhona MacLeod finds likenesses between herself and the victim. Could he be the son she put up for adoption 17 years before? Sunset Song by Lewis Grassic Gibbon: Recently voted the best Scottish book of all time, Sunset Song remains a classic across the land. What young woman wouldn’t identify with its heroine, Chris Guthrie, torn between the countryside of her birth and the modern world? The Prime of Miss Jean Brodie by Muriel Spark: As much a time and a place as a character, Spark’s Jean Brodie came to embody a generation of Edinburgh women. Her unconventional ways and blatant favouritism made her both terrifying and alluring. Knots and Crosses by Ian Rankin: This is where it all started for John Rebus – Rankin’s hard-drinking Edinburgh crime-fighter – with the murder of three girls. When messages made of knotted string and matchsticks start arriving, Rebus realises it’s personal. Buddha Da by Anne Donovan: This beautiful novel won rave reviews when first published three years ago. Though written entirely in Glaswegian Scots, it is an easy and lyrical read about a decorator who becomes a Buddhist. Whisky Galore by Compton Mackenzie: So what if it perpetrates the old, cliched ‘Brigadoon’ myth? Scots, English, American or Martian, no-one can resist this tale of ill-gotten whisky gain on a Scottish island in wartime. It’s simply hilarious. 44 Scotland Street by Alexander McCall Smith: Without wishing to blow our own trumpet (well, maybe, just a bit), this tale of manners and intrigue in Edinburgh’s New Town debuted in The Scotsman in 2003 as a daily novel. McCall Smith is feted in America almost as much as JK Rowling. Boswell’s Edinburgh Journals: High times and low lifes in the Edinburgh of the Enlightenment. Boswell’s diaries were instrumental in documenting 18th-century Reekie as he drank and debated philosophical thoughts with Adam Smith and David Hume, and mixed with the city’s seedier side. Trainspotting by Irvine Welsh: When the movie was released, American cinemas showed it with subtitles. Despite the language barrier, Welsh enjoys a huge following in the US – his uncompromising attitudes make a refreshing change across the Atlantic. Selected Poems of Carol Ann Duffy: Passed over for Poet Laureate a few years back, Duffy is nonetheless Scotland’s foremost poet. Whether writing about love, loss, or childhood, Duffy’s voice is clean, clear and accessible. Many see her as a cheerier, modern-day Sylvia Plath. Greenvoe by George Mackay Brown: When a mysterious military project threatens a way of life unchanged for generations on the Orcadian island of Hellya, chaos prevails. Mackay Brown’s evocative writing conjures up the myths and magic as well as the isolation of island life. Kidnapped by Robert Louis Stevenson: Henry James was one of RLS’s greatest champions, while Donna Tartt says she owes much of the style of her second novel, The Little Friend, to Kidnapped. Revel in young David Balfour’s adventures and marvel at how it engages young and old. Lanark by Alasdair Gray: A Glasgow institution, Lanark was Gray’s first novel, and arguably his finest. Many shiver at the words Great Scottish Novel, but, if ever a book were worthy of this esteemed title, Gray’s marvellous four-part colossus could be it. The Missing by Andrew O’Hagan: Mixing autobiography with social commentary, O’Hagan asks what impact a human being going missing has on livelihoods and communities. Examining a side of Britain often unseen and unheard, he brings light to a country many of us would not recognise. New Selected Poems by Edwin Morgan: His public appearances sell out in seconds, and he is more universally loved by Scots than the Cairngorms. This includes older poems as well as his more recent work, including a suite of ten poems which tells the history of the earth. Relevant to us all. The Wasp Factory by Iain Banks: Dark, detached and brilliant, Iain Banks’ first novel remains his finest. Frank is a teenager on a remote Scottish island whose strange obsessions, and the varying degrees of insanity of his family members, become increasingly horrifying. Makes Stephen King look like Beatrix Potter. Young Adam by Alexander Trocchi: The second book on our list to have been made into a film starring Ewan McGregor, Trocchi’s most famous work, set on barges travelling between Glasgow and Edinburgh, has drawn parallels with Albert Camus’ The Outsider. Quite pornographic in parts. Waverley by Sir Walter Scott: For tourists who have arrived at Waverley station and visited the Scott Monument, this is the real thing. The story of the Jacobite uprising of 1745 and the idealistic young Edward Waverley, drawn in to Bonnie Prince Charlie’s web. A classic of classics. The Cone Gatherers by Robin Jenkins: Scotland’s Of Mice and Men, Robin Jenkins’ haunting novel is set during the Second World War on a Scottish country estate and tells the story of two brothers working as cone gatherers. Mysterious and tragic, it remains a classic moral tale. Divided City by Theresa Breslin: It’s the marching season in Glasgow and young Graham just wants to play football, but he finds himself involved in old rivalries between Catholics and Protestants, and, in newer conflicts, with a young Muslim. This children’s book is a timely insight into sectarianism and racism. 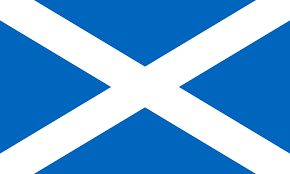 For the insatiable reader, here’s The List‘s list of 100 best Scottish books. The inclusion of Joseph Conrad and George Orwell may give you slight pause (though Blair is a Scottish name), but apparently to be Scottish a book can be written in Scotland or first published there! Thus do we colonize the world. My source in a couple or recent posts is Bookbinder’s Chronicle. MHR’s instructional videos are calming and clear. Here’s one on the steps prior to case making: it goes on for almost 15 minutes but is so fascinating that it seems no time at all. Other videos can be found at her YouTube channel. The advantage of this video is that it gives a quick revision of the previous steps, each of which its own video. We all know what headbands look like before they are applied to our books. They consist of a canvas backing about 1/4″ wide with some silky colored thread stitched on to one edge. Here’s an example (from Hollander’s website). But hang on a minute — like so much in the book making world these are merely the convenience-version of the original product, which had to be sewn onto (and into) the book block after it had been folded. collated, had the endpapers applied, and been rounded and backed. Obviously this hand sewing took a lot of time (money) and unsurprisingly was mechanized away quite quickly. Hand binders call these machine-made headbands “faux headbands”. Bookbinder’s Chronicle has this charming instructional video which will enable you to do the job properly on your next de luxe project. It lasts for about 20 minutes but its zen-like quality makes time fly. We always have a slight difficulty in naming the headband which goes at the bottom of the spine. Is it a footband? Or maybe a tailband? We do seem able to say head and foot bands, or head and tailbands, so I guess we can use either in the singular too. In Britain, we would tend to do an edition with headbands only i.e. bare at the bottom of the spine — that was before we stopped using them at all of course! And why are headbands used? Originally the headband, as shown in the video added some strength to the edges of the spine which would help with pulling the book off the shelf. You will no doubt have noticed the tendency for things to fall apart here. So we add these glued on bits of cloth merely as a gesture toward the solid book-making methods of the past. For the addict, here’s sewn headbands II, constructing a French Double headband. Just as fascinating. This may be the other side of the coin when taken together with my previous post. Attention was drawn to this by The Reader’s Catalog, a mail-order service of bookish things offered by The New York Review of Books. I do think it has the Book Bath Bag beaten hands down on practicality. The soundtrack is especially rousing! There was a move a few years back to get publishers to print books, like maybe lab manuals, on this sort of waterproof paper. I think it rather petered out as the paper was significantly more expensive than the ordinary stuff (and of course most publishers wouldn’t really want to produce an eternal book — if the customer spoils it, they just have to go and buy another copy after all)! Still I dare say some books are printed this way — Google images shows a couple, Minnesota Fishing Guide and River Guide, not inappropriately, so there may be life in this idea yet. Rite in the Rain’s website can be found here. Can this really be true? 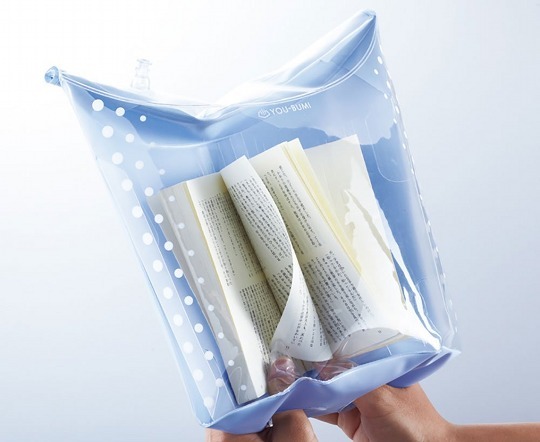 I suspected The Onion might be behind it, but it looks like Japan Trend Shop: Tokyo’s Gadget & Lifestyle Select Shop (via Geeky Book Snob) will send you a “You-Bumi Waterproof Book Cover Bath Bag, Book Reading Case, Jacket for Bathing, Pool” for $85 plus $18 shipping. Click here to purchase! We have all probably heard that grain direction is important, though maybe we’re a bit hazy about why. The grain direction is fixed in the paper-making process. Pulp is poured onto a web traveling rapidly forward; joggling around on it, the pulp (a mixture of cellulose fibers and 98% water) will naturally arrange itself with the fibers running parallel to the direction of travel. The grain direction is the direction in which the fibers are lying. Grain direction is important because (in an ideal book world) the grain direction of the text, the endpaper, and the board should all be the same, parallel to the spine of the book. This is because paper is easier to fold along the grain, and if moisture is picked up all the elements will react similarly and cockle across the top dimension (usually the shorter one) rather than struggling against one another. Determining grain dimension is relatively straightforward: just tear the sheet. You’ll get a long clean tear with the grain, and a raggedy back and forth against the grain. This works fine with newsprint or disposables, but if you value your product, gentler methods may be superior. Here, from Bookbinder’s Chronicle is a video showing two non-destructive methods.